The personal is the political in the fifth LP of Rhymesayer's heavy hitter. Produced in entirety by Jake One, it's as American as music gets: fearful, angry and hopeful, all at the same time. Right now, I’m unemployed. I mean, I’m writing for PopMatters, so you could call that a job if you want, but my landlord doesn’t. My folks just transferred money for a security deposit to my bank account, and I can’t stop looking at my account online, amazed that this many dollars even exist in the world. 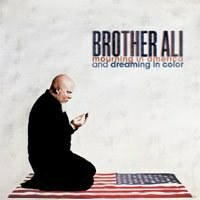 Brother Ali’s newest album, Mourning in America and Dreaming in Color, doesn’t talk about my financial problems specifically, but it talks about them in the way that you might be able to relate to as well: a guttural knowledge that something’s deeply wrong. And because it’s able to connect in quick punches and broad strokes, it’s visceral and alive, more than most musicians, rap or otherwise, would dare try for. Most of the time, at least. Like it’s mouthful of a title would suggest, Mourning has a big vision, and sometimes that means getting lost in the weeds with unclear targets, like the shaky antagonists of "Won More Hit" (Eminem? Bob Dylan?) or the bizarrely underused Bun B guest spot on "Need a Knot". Ali has said that on the up-with-people opener, "Letter to My Countrymen", Dr. Cornel West actually gave forty minutes of unrehearsed poetry for his guest verse, a perfect metaphor for the editing Mourning could use. Not to get too negative here, because even on bad Brother Ali tracks you’ll find a verse or two worth rewinding. As the now most-prominent member of mid-2000’s Minnesota highlight crew Rhymesayers (although, new P.O.S album in October! ), Ali has been making large tracks out of small moments for a while now. Back in 2008, on a track off Jake One’s now-classic White Van Music, he was stealing baby food for his kid and tying directly back to Reagan’s economic theories. Now he’s got Jake One for a whole album, and the personal and the political become once again. Ali seems to need to work at extremes, and catalogs the last few terrible, terrible years on "Stop the Press": Rhymesayers falling apart, his father’s suicide and marital troubles all brush up against each other. It’s a painful and shocking track, the first time Ali’s voice raises to a level of pain on Mourning, and it won’t be the last. Any one of the topics on "Step the Press" could fill a whole album, and they do come up at other places, but Ali would rather use his own troubles to talk about greater goal. "Work Everyday" jumps from the story of struggling to pay the bills ("Got a stack of red bills at my house, looks like Valentine’s Day") to a full-throated Keynesian critique of red-state conservatism ("the government doesn’t make us help anyone else/then they stick a red sign in front of your house"). Imagine the best G-Side hustle anthems with a political bent. Jake One gives the album more than consistency, he gives room for Ali to breathe. Strings and guitars pop up everywhere, giving an intimacy, a you-are-there feeling that molds itself to Ali’s intimacy. The background singers on "Work Everyday" might as well be woodland creatures helping you get dressed, on "Fajir" they sound like a marching army. There aren’t any bangers, nor any of the creeping dread he’s given to 50 Cent or the retro-futurism he worked out with Freeway on The Stimulus Package. Different styles for different guys. There's a communal vibe here, like the whole neighborhood turned out to help. The lack of anthems is especially curious, but also makes sense. The cover of Mourning shows Ali in a state of prayer: for the religious, an experience that can both calm and equal the totality of existence. Mourning for America isn’t an album built three minutes at a time, for reblogs or likes. There’s some bulk that could still be cut, but it’s based on peaceful idea that quality begets quality, on to the next one, one solid track leads to another. One word that never get mentioned on Mourning in America is ‘Occupy’, and it’d be nice to think that that’s because Ali knows that with this album, he’s supplying something that infighting anarchists never could: a sense of unity, a sense of purpose, a sense that you’ll be putting on this repeat for more than a year. I’ve gotten multiple job rejections while writing this review, but Mourning in America makes me want to apply to just one more.